Do you know an individual or a company that wants to support a great cause? Ryan House is always looking for new partners! Our Third Party event possibilities are endless! Ideas include golf tournaments, Mitzvah projects, bake sales, bike rides and much more! Download the Third Party Application below and follow the easy steps to fill it out from there. We offer plenty of opportunities, regardless of age and means, for you to get involved and make a positive difference in the lives of our children and families. Every home needs grandparents. The Grandparents Guild is a committed, caring and energetic group of grandparents and honorary grandparents that has banded together to support Ryan House and enjoys an annual Ryan House social event. This group supports our mission through an annual $100 membership donation per individual, $175 per couples. Would you like a member of our Grandparents Guild to come and speak at your group and/or organizational meeting? The Kids for Ryan House program encourages philanthropy and volunteerism for kids of all ages. They learn they can make a difference through projects that help children with life-limiting or life-threatening conditions. Big or small, all support makes a difference. By becoming a Kid for Ryan House, you will help children who need extra support. 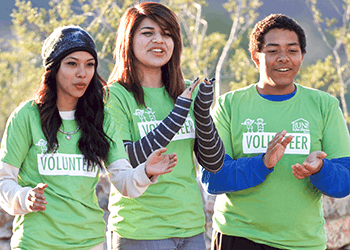 You can connect with others, like you, to perform volunteer and community service in your neighborhood. Whether just you, a bunch of friends, or a whole school, your participation in Kids for Ryan House will make a difference for our families and in our community. Download the Kids for Ryan House Brochure or contact us with the amount of brochures you need. As part of the Kids for Ryan House program, members agree to a minimum of one volunteer activity per year to help the children at Ryan House.